From such wisdom can come such foolishness. In economics, we calculate the outcome of an uncertain event with a simple concept called “expected value.” Simply put, just multiple the probabilty of something happening by the value. For example, if we have 10 eggs, the event can be 10 chickens. If each egg has say… 20% chance of hatching, one should multiple (value)X(probability) = (10 eggs)x(20%)= expected value of 2 chickens. While this is a simple concept, many find it very difficult to actually gauge reality in such a rational method. Not counting ones chickens is meant to deter the proud from foolishly assuming the outcome is set in stone. Consider, for example, a proud boy dreamed of the chickens he would soon have. After walking back with ten eggs, gloating to all his friends, and promising chickens, he falls over and breaks four. What this boy is doing is rounding the probability of his event up to 100%. On the other side of the story, this adage can be taken too seriously where one assumes he will receive no chickens. The boy had rounded up to 100%, therefore thinking (10eggs)x(100%)=10 chickens. If he had listened to the wisdom, he should have assumed the probability of eggs hatching to be 0%, or (10eggs)x(0%)=0chickens. While the latter attitude fights pride, both can cause distorted perspectives. If the seven out of ten chickens are to hatch and the boy was assuming zero would, he would be very malequiped to take care of his newly born chickens. He would have built no chicken coops, nor would he have bought feed. I would expect that several might die. In my eyes, rounding to 0% is a poor method of viewing reality. I believe never calculating chickens can restricts people. A result can be that they never put themselves out there with a pessimistic assumption. They may undermine themselves in conversations with other people which further reinforces that concept. Many end up doing substantially less than their potential. 1) I don’t think this saying is wrong. I just think I know too many people who intrepret it wrong. 2) Almost everyone is at some extreme, and usually either round the probability too high, or too low. Balance is necessary, and sometimes asserting that the probability should be 0% is the best to push that fellow into a realistic mindset. My friends and I, however, tend to be on the opposite spectrum. Rational thought is the goal, but this balance is rarely achieved, even by me. Rational thought is something to be saught after. Unfortunately, rationality is so easily killed by emotions. Fear twists the probability down, positive feedback pushes the probability up. 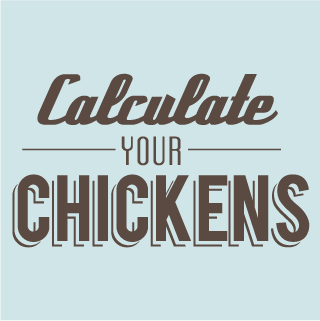 Try, try to calculate your chickens.